In choosing this color, the selection committee noted that given the increasing role of technology in modern life, people seek authentic connection and intimacy. The Pantone Color Institute selected the vibrant hue as a “fusion of modern life” because it “is a nurturing color that appears in our natural surroundings and at the same time, displays a lively presence within social media.” The color is intended to represent optimism, joy, and playfulness. For those looking to incorporate this spirited shade into their jewelry choices, there are a couple ways to go. Precious coral has been polished for use as an opaque gemstone since ancient times, and was especially popular during the Victorian Era. Its use in jewelry has declined in recent years, in part due to concerns over the environmental impact of harvesting slow-growing coral to meet consumer demand. If you like the look but love the ocean, shop for vintage coral earrings, rings, or beads, which won’t harm today’s reefs. If you prefer coral color in a clear gemstone, morganite is a great option. 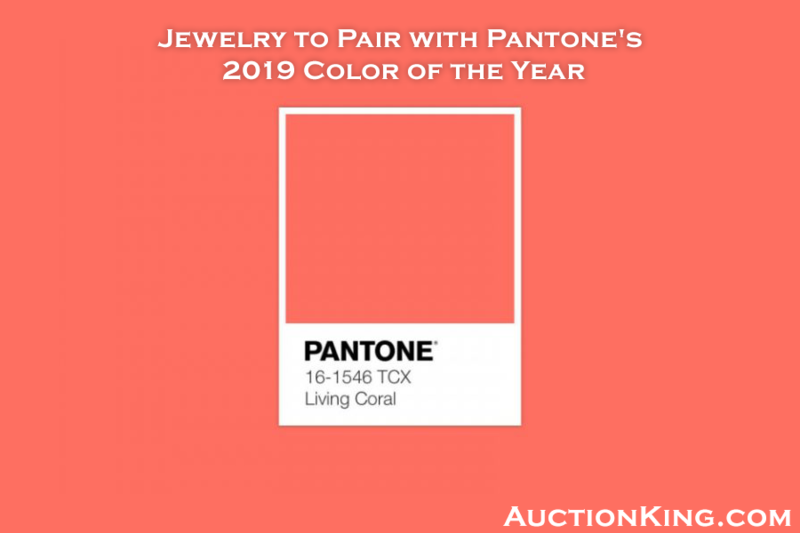 The peachy-pink stone has the warm tones of Pantone’s selection for 2019, and is readily available in large carat sizes perfect for cocktail rings or stunning pendants. Even though it has become quite sought after, morganite remains relatively affordable in larger sizes. This gemstone is frequently paired with rose gold, which amplifies its golden tones. On the other hand, if you’re wearing a coral ensemble, you may not want to match the hue in your jewelry. In that case, consider creamy pearls, which offer a lovely neutral counterpoint and also evoke the oceanic origins of coral. White opals can offer a similar neutral choice with a fiery twist. For an eye-catching pop of contrast instead, green gems such as emerald, peridot, or jade evoke a sustaining connection to nature, although they by no means represent all the colored gemstone choices that would look attractive with this shade. Whatever gemstone you choose, yellow and rose gold will harmonize most effectively with the warm undertones of Living Coral, so look for settings in those precious metals. At AuctionKing.com, our selection of fine necklaces, pendants, earrings, bracelets, rings, and loose stones give you a rainbow of colors to choose from every day, whether you’re setting a trend or making a unique style statement. Every piece is triple-checked for authenticity so you can bid knowing that what you see is exactly what you’ll get. We seek out unusual and precious pieces so our customers around the globe can enjoy top-quality fine jewelry at below-retail prices every day. To start bidding and start winning, register for a free online account today.